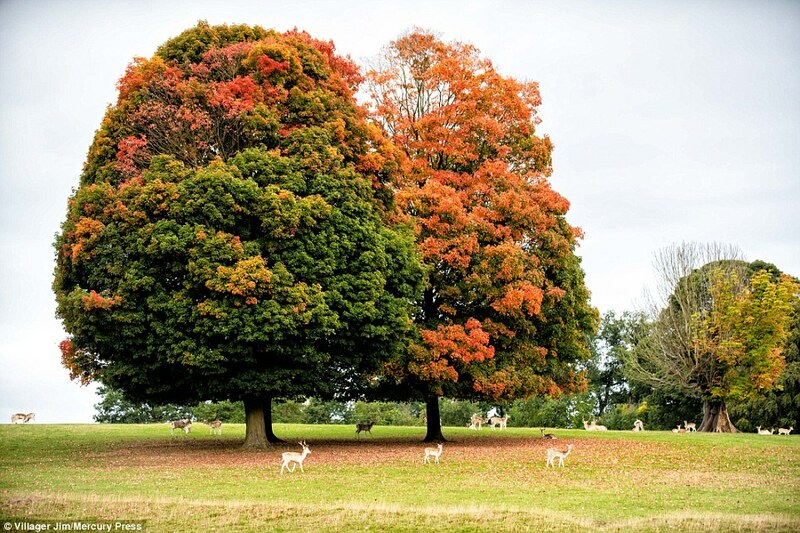 Much of the UK will be looking forward to enjoying an ‘Indian Summer’ this weekend…before battening down the hatches in readiness for Hurricane Helene which could pose a ‘danger to life’. 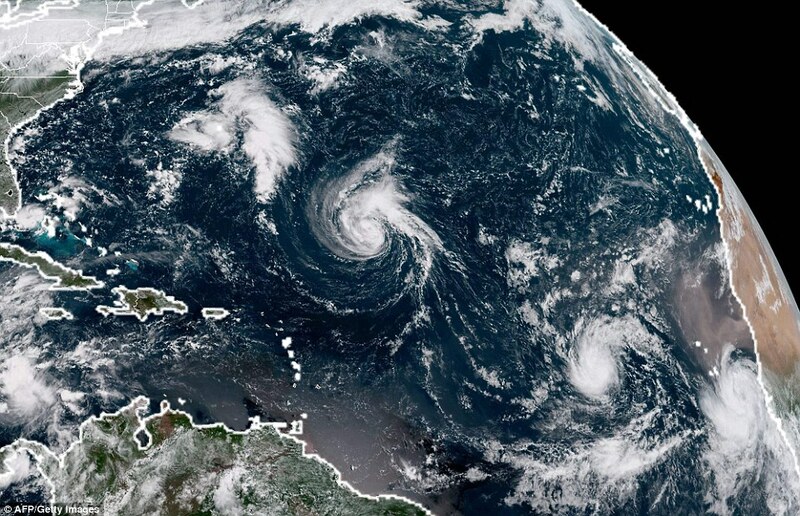 Helene is currently one of a glut of tropical storms in the Atlantic, with Florence sparking mass evacuations as she heads towards landfall in the US states of North Carolina, South Carolina and Virginia. And the remnants of the storm are set to hit Britain next Tuesday, prompting fears the south west and Ireland could experience strong winds of up to 70mph and heavy rain, with weather warnings issued for Monday night and Tuesday morning by the Met Office to beware of flying debris. But the tropical weather will also bring warm air to eastern parts of the UK, meaning the mercury could rise to as high as 80F by Tuesday. It will follow a pleasant weekend for central, southern and eastern parts of the UK where locals will enjoy sunshine and temperatures of 77F. 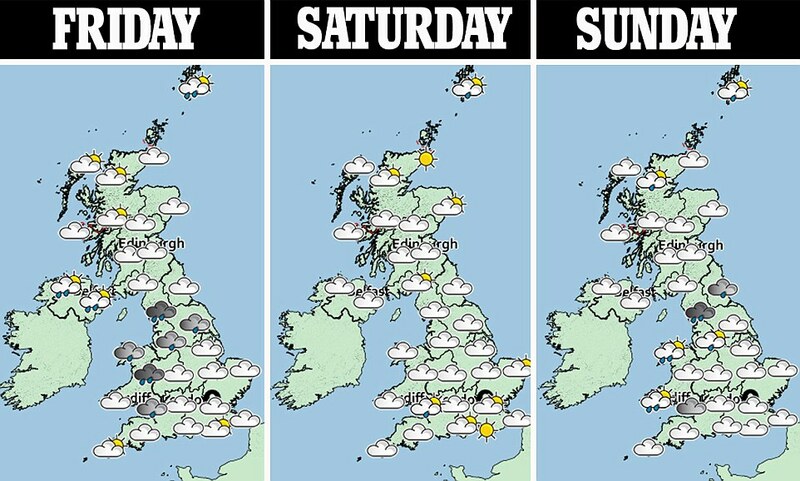 Met Office spokesman Grahame Madge told MailOnline: ‘It will be warm over the weekend in the south east and eastern parts of the country, like Norfolk, and these conditions are going to remain during Monday and Tuesday when it will get very warm. ‘This is because of the influence of Helene. She is currently south west of The Azores in the Atlantic and is on track to reach us next week, although she is losing strength all the time. On Tuesday the hurricane’s remnants could hit Britain, by which time it will have downgraded to a tropical storm. Wind speeds will drop to 70mph on the way, but the storm could bring wet and windy weather if it hits the jet stream before the UK. Even if it misses the UK, the storm could supercharge the warm air already expected in the country. The east and south-east of England is expected to hit 77F as it is, but Helene could push them higher. He added the high temperatures would come with cloud and rain making for humid conditions. Meanwhile Mr Madge confirmed yellow weather warnings had been issued for the south west, Wales, and north west on Monday night and Tuesday morning over strong winds. The warnings said there may be risk to life due to ‘flying debris’ and that public transport services and roads could also be affected. The Met Office added Helene could be heading east towards the south-western corners of the UK, with the tip of Ireland among the worst affected. 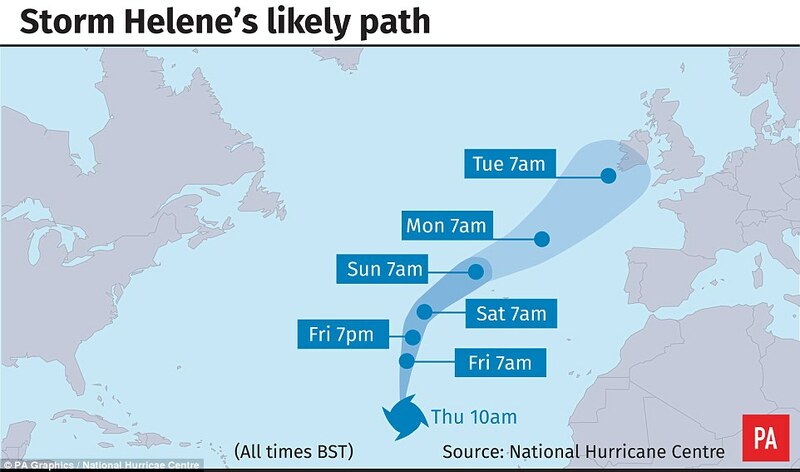 She said: ‘Helene is moving up from the Atlantic towards us. 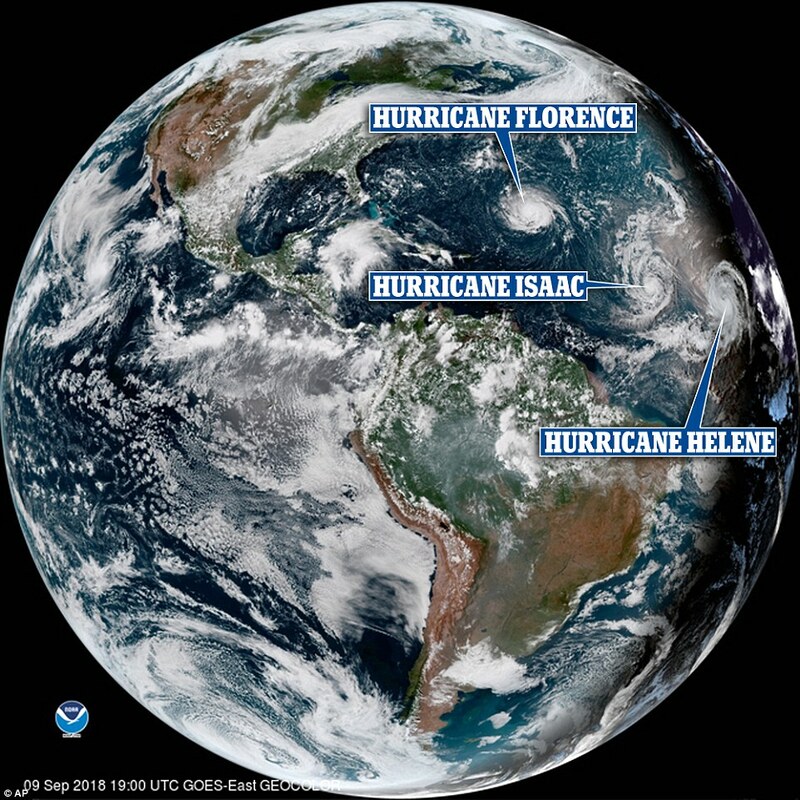 ‘Hurricane Joyce is also in the Atlantic so we need to see how those two systems are going to move around each other because that could have an impact. This graphic shows the temperature across the country as well as the wind speed, precipitation and air pressure. It also shows how the UK compares to other countries on the continent. This interactive module, which is continuously updated, represents the picture across the UK. 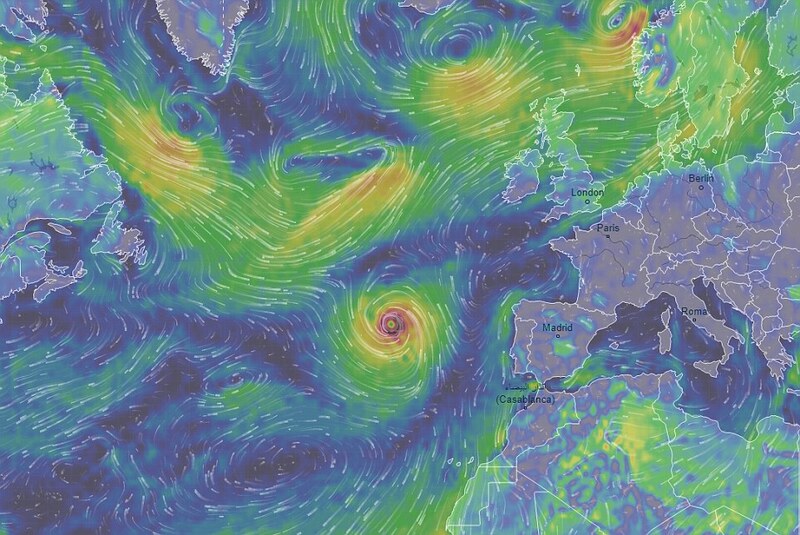 It shows high pressure sweeping across the country as Storm Helene pushes in. Generated by a super computer and updated every three hours by the National Weather Service, the graph shows strong winds sweeping across the Atlantic and the Channel. Meanwhile, odds on the hottest ever September have hit record lows, with bookmakers offering a 4/6 shot (from 10/11) that this goes down as the hottest September on record.